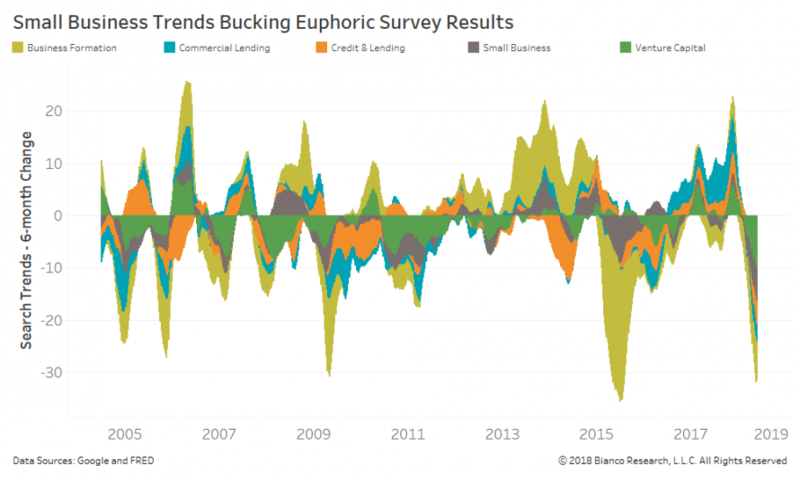 In a Bloomberg column on May 4th, Jim Bianco and Ben Breitholtz of Bianco Research argued convincingly that economic surveys no longer work as a predictor of future economic activity, because surveys (the so-called soft data) suffer from a circular reference due to groupthink, herd mentality, and political preferences. 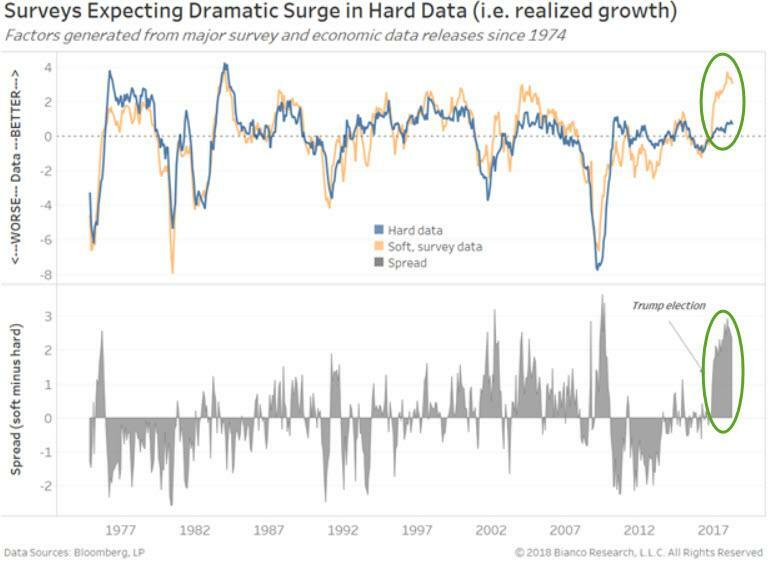 Not only that, Bianco and Breitholtz show not only that the surveys are biased, they have a poor track record - but don't tell the Fed, they think surveys are the holy grail of economic forecasting. Therefore Bianco Research's team has been arguing that google searches are better than the surveys and should be used in their place (and as they show below, offer some very different 'real' insights than the herd mentality of surveys). 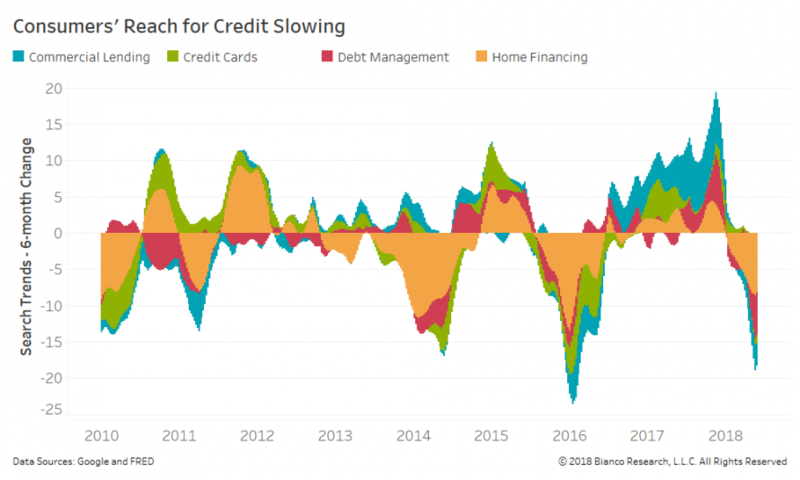 Consumer searches (Google) indicate low anxiety, but deteriorating spending, credit, and business formation. Our nowcast for Q2 GDP resides at 3.12% year-over-year, below similar forecasts by the Atlanta and New York Fed. The chart below shows our nowcast for U.S. real GDP during Q2 2018 rising to 3.12%. We employ Google search trends for over 180 major categories measuring consumer and business behavior. The words entered into Google’s little black search box provides a real-time and purer assessment of consumer desires, needs, and biases. 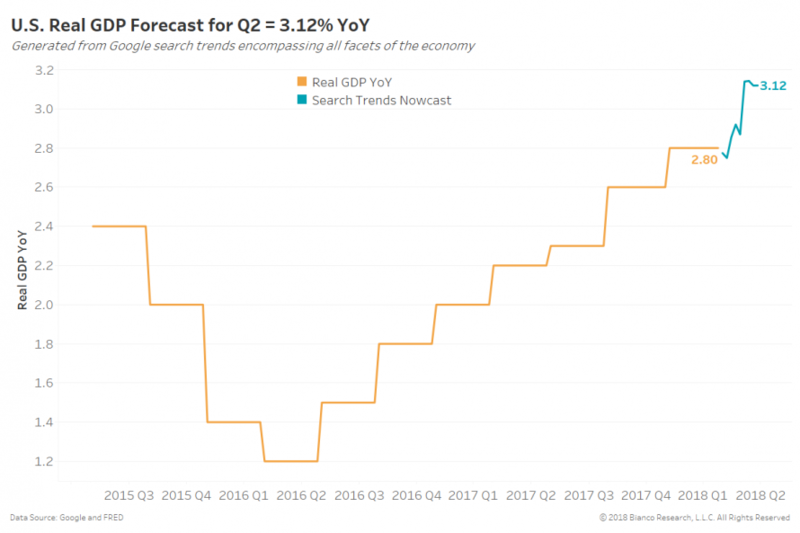 Consumer search trends are generating lower expected GDP for Q2 than the Atlanta (4.8%) and New York Fed (3.3%). 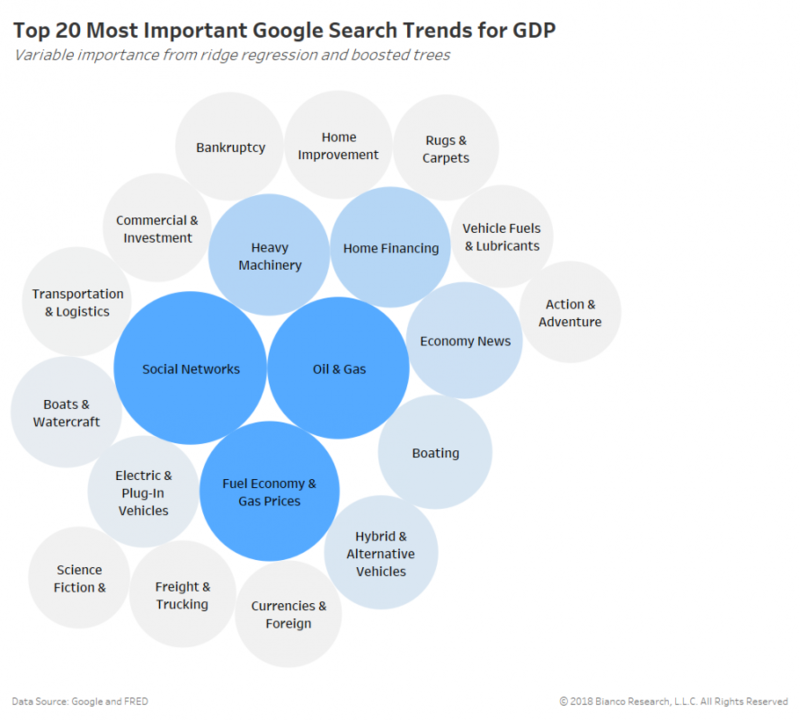 The 20 most important search trends for forecasting GDP are shown below. Darker and larger circles indicate greater importance within our ridge regression and boosted tree models. Social networks, oil & gas, heavy machinery, and home financing stand at the top of the totem pole. The next series of charts show six-month changes in search trends by category. 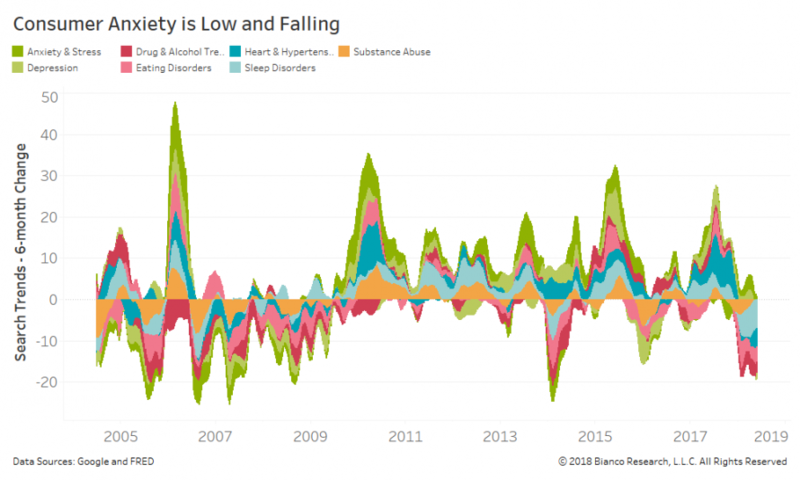 The first chart shows the level of anxiety felt by consumers by measuring searches for stress, drug use, hypertension, depression, and more. Anxiety has indeed abated to levels seldom seen post-crisis. Traditional surveys are soaring high, which may explain much of this relaxed nature of consumers. But, consumer spending has been rolling over into the spring of 2018. 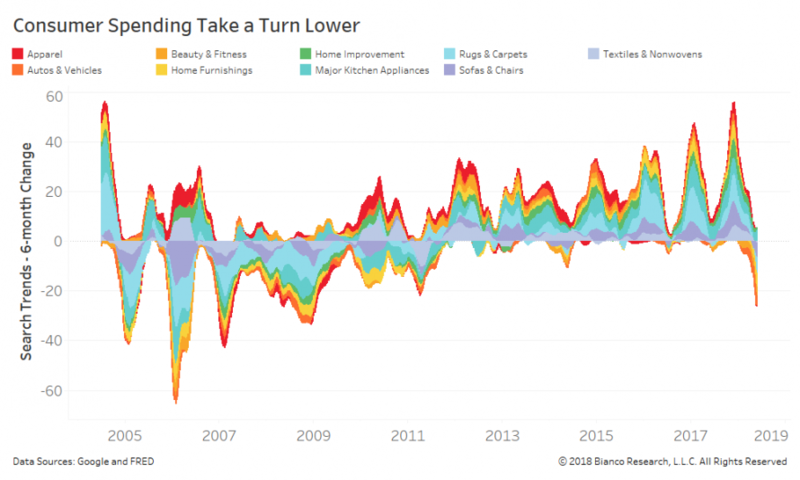 The next chart looks at changes in searches for apparel, home improvement, autos, furniture, and more. The dwindling popularity of these types of search has reached the fastest pace of decline since 2009. Will this be a momentary blip or a lasting shift in trend? Small businesses, one of the main engines of the economy, are seeing less frequent searches for business formations, credit, and venture capital. Financial conditions have modestly tightened, but a greater crimp is likely coming with an additional three-to-four hikes by the Federal Reserve. My fear is the oldest story in finance is going to play out. The Fed intensely watches the soft survey data and thinks the economy is booming and inflation is about to come roaring back. They hike too much and invert curve and that impairs the economy.